Re: More for the store? Not as cool as the original first generation cool mugs though. Am I the only one who, upon seeing this image, realized that Luxembourg looks a lot like a chicken? Create a terrifying Chickembourg chimera to destroy Tokyo? You are all bad people and this is a horrible talk forum. What sizes is that shirt available in? It's available in all the usual sizes: tiny and very tiny. 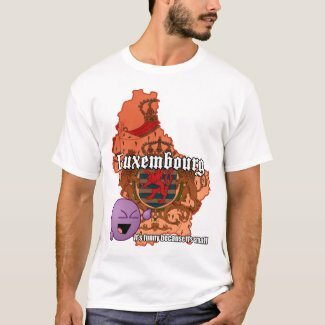 I was just in the store showing one of our genealogists, of Luxembourgeois extraction, the LOL Luxembourg shirt. I noticed that we have no merchandise. I think this is a horrible oversight that should be rectified immediately.